After my chickenpox period and winter vacations, I went back to hostel on 6th Jan only to find that the vacations had been extended for two more days due to the biting cold here in Delhi. 3rd had already been declared the coldest day Delhi had seen in 5 years. And now we were back at school. Most of the month of January was spent in fast-completion of the syllabus as the finals were fast approaching. Most of my and my co-hostellers’ time was spent in many things but studies. Above all was the adieu ceremony. We were nine and we had to give farewell to 27 seniors at the boys’ hostel. We were not serious at all until the last week, when it dawned upon us that we had achieved nothing in the fruitless long-hours wasted together. I went home on 24th and prepared the slideshow-video with the help of photos that we had clicked together at the hostel with our seniors over the past weeks. This also included some stolen photos of our seniors from their orkut albums. In the 72 hours of 28th, 29th and 30th January, we had a total sleep of just 6-8 hours. Although we managed to sleep for two-three hours, two of my friends didn’t sleep at all on Farewell eve. And this was a mistake! We all were really very tired even before the program began. The D-day arrived. Till almost 2 PM on 30th Jan, nothing was ready. Then after the tent-house people put up the white-violet backdrop, our workshop began. Till almost 5, we were working on decorating the backdrop. We missed the farewell at the school and almost skipped the lunch. At 6.15 I went for a quick shower and put on the sherwani that I borrowed from one of my seniors for the evening. 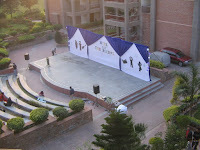 By 6.30, we were down by the stage and I was busy in setting up the laptop and the projector. It was dark by then. The program kicked off after the arrival of our seniors, wardens and principal. Although there were quite many mistakes and some last-minute program-cancellations, our overall performance was well appreciated by all. The video (see pic above) was successful in serving its motive: sabko rulana. I came back home on 31st, saw Slumdog Millionaire, the yet-to-win 8-Oscar movie (Which I personally believed was an excellent movie but there were movies from our own land that deserved better. But still, Jai ho) and went back on 1st Feb, for what was to be my longest stay at the hostel: 25 days at a stretch. I had my final exams with least preparation and some important decisions of my life were taken for the first time ever by me. I am not going to tell about this to anyone now…And anyone means truly anyone! May be some other time…Good day!